In 2009 we introduced our "Special Release" series, exclusive bottlings from single casks. These are released on a very ’ad hoc’ basis, not regularly. 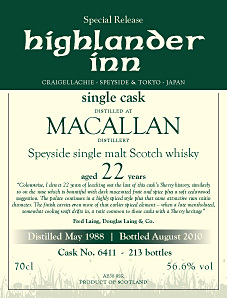 Another of our Special Release Single Cask Malt Whiskies arrived at the Highlander Inn from the bottlers at the end of August 2010. A 22yo Macallan from a 2nd fill sherry hogshead, the cask only gave up 213 bottles at 56.6% abv. There was a tremendous amount of interest in this bottling, and the last bottle was sold in December 2010. In November 2009 we released our 2nd Special Release ~ a 27 year old Caol Ila single cask. It was available to purchase exclusively from the Highlander Inn at £100.00 per bottle (700ml), and also by the glass (25ml) in our bar at £8.90. Unfortunately it has all sold out. This was the first time that the name of our sister establishment in Tokyo has appeared on the label and they also have it for sale by the glass. In June 2009 we released the first of our Special Releases ~ a Caperdonich 36 year old single cask. Essentially this was a staff bottling, with the name of each member of staff on the label but we also had some bottled with just the Highlander Inn logo on for general sale. It sold out within a few weeks!